Novelist Carol DeMent joins me today to chat about her new historical mainstream work, Saving Nary. During her virtual book tour, Carol will be awarding a $10 Amazon or Barnes and Noble (winner’s choice) gift card to a lucky randomly drawn winner. To be entered for a chance to win, use the form below. To increase your chances of winning, feel free to visit herother tour stops and enter there, too! Carol DeMent worked in the field of South East Asian refugee resettlement for seven years, and completed master's level research into international refugee resettlement policy. She lived for two years in Thailand as a Peace Corps volunteer and has traveled extensively in South East Asia. Her first novel, Saving Nary, was a Finalist in the 2017 Next Generation Indie Book Awards. Welcome, Carol. Please share a little bit about your current release. 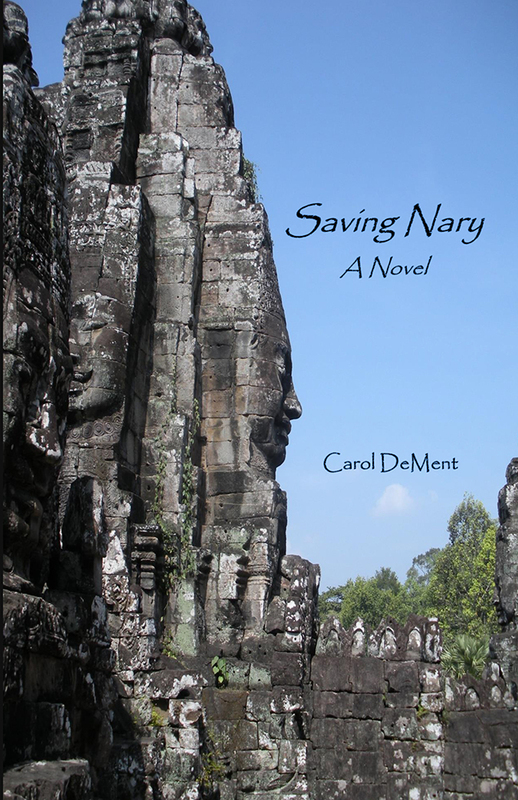 Saving Nary is the story of a Cambodian refugee searching for his missing daughters. 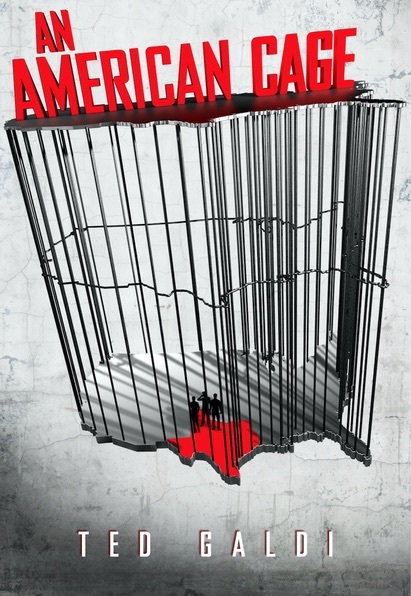 It explores the complexities of wartime loyalties and impossible choices, the bewildering cultural and linguistic challenges of resettling in a new country, and the hesitant journey toward healing from war-induced trauma. Dotted throughout with wry humor, Saving Nary is a compassionate look at what it means to lose- and rediscover-a life, a home, a sense of self. “Silence that boy,” the soldier had said to his wife on that awful day. Khieu gathered their son Bunchan into her arms, but how is one to soothe a toddler who cries from hunger when there is no food? Khath, Khieu and their three children had been walking for three days in the heat and humidity, shoulder to shoulder with thousands of other refugees inching their way out of Phnom Penh by order of the Khmer Rouge. Already hunger, thirst and exhaustion had thinned their ranks: the elderly and the ill simply dropped along the sides of the road, patiently awaiting the mercy of death. Given only minutes to prepare for their exodus, the food Khath and his family carried was gone in a day. After that, they bought, scavenged and bartered for whatever nourishment they could find along the way. Now, they stood next in line before a table of grim-faced cadres in the simple uniform of the Khmer Rouge: black cotton shirts and pants with kramas, red-checkered scarves, wound around their heads or necks. The cadres were checking identity papers and quizzing the refugees about their prior occupations. Khath saw the man’s tight lips and clenched jaw and stepped between his wife and the soldier, doing his best both to shield his family and appease the angry cadre. Khieu’s frantic attempts to calm Bunchan had the opposite effect. Red faced, the toddler screamed his hunger to the skies above. The soldier flicked his eyes to one side, turning slightly. Following his gaze, Khath saw a man standing a little apart from the check-point, watching the scene impassively. As Khath waited, his heart thudding inside his chest like the heavy, dread beat of a death knell, he saw the man glance at the position of the sun and cast a look at the road behind Khath, densely packed with men, women and children yet to be processed through the checkpoint. The man rubbed his left jawline as though he had a toothache, but perhaps it was his ear, missing its earlobe, which was causing the pain. At any rate, he frowned and seemed to come to some sort of decision, for he looked at the soldier and gave a barely perceptible nod. At that, the soldier moved quickly, brushing past Khath and yanking Bunchan from Khieu’s arms. “You had your chance,” he said to Khieu, and began striding toward a large tree not far off the side of the road, the bawling toddler slung under his arm. “My baby! Give me my baby!” Khieu screamed and rushed after the soldier, grabbing at Bunchan, whose angry howls had turned to terrified shrieks. Khath’s daughters, crying, tried to run after their mother but Khath held them back. A terrible dread filled his heart as he watched the scene rapidly unfolding before him for he knew that the Khmer Rouge were ruthless when crossed. I have two projects on-going at the moment. One is a novel about the cultural impact on a pioneer family of the influx of Chinese mine and railroad workers in the West. Set in Montana in the late 1800s and early 1900s, the story is narrated through the uncensored eyes of a young girl exposed to a new culture at a time of great turmoil in her own family. The second is a memoir from my years of serving in the Peace Corps in Thailand in the 1980s. Though I have been “writing” since childhood, it wasn’t until a college research project on the Prohibition Movement ended up being nearly 100 pages that it occurred to me that I might be able to write a full length novel. The techniques I learned then for tracking down information and organizing it have been invaluable to me as I research my books. 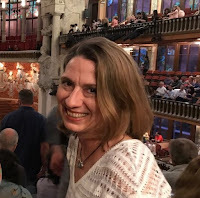 Joining a serious critique group, the Puget Sound Writers Guild, marked a new level of commitment for me in moving from thinking of myself as a writer to being a writer! I currently do not write full time, though in the past I supported myself for ten years as a grant writer. For the last twenty years, I have been a licensed practitioner of East Asian medicine, essentially acupuncture and Chinese herbs. Due to my schedule, I end up usually working on my books in the evening, but I really love to write on rainy days! Unlike many writers, I do not write every day. Instead, I think and think and think about the story for days until the pressure to write becomes almost unbearable and I head to my computer for a cathartic, stream of consciousness splat upon the page. I literally will “write” entire dialogues and scenes in my head until it all overflows onto the paper. After reading “Sue Barton, Student Nurse” I couldn’t wait to grow up and be a nurse, mostly because of the memorable scene of Sue wandering lost in the steam tunnels of the hospital where she was training, and being rescued by a handsome young doctor. Then I wanted to be a dancer while in high school until it became evident that my back was as stiff as a board. I love hearing from readers about what they thought of Saving Nary, and if they gained any new insights from the book. I especially love going to book groups that have read the novel and answering their questions and participating in their discussions. 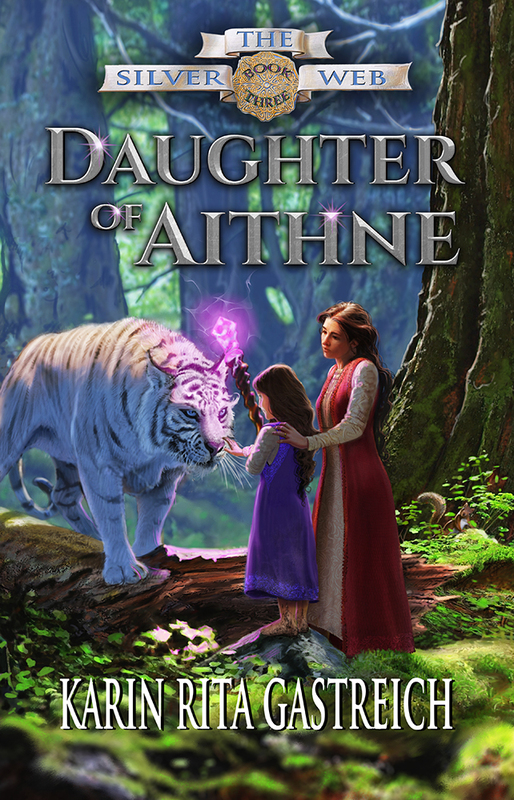 Novelist Karin Rita Gastreich joins me today to talk about her new fantasy release, Daughter of Aithne. During her virtual book tour, Karin will be awarding a $15 Amazon or Barnes and Noble (winner’s choice) gift card to a lucky randomly drawn winner. To be entered for a chance to win, use the form below. To increase your chances of winning, feel free to visit her other tour stops and enter there, too! Welcome, Karin. Please share a little bit about your current release. The third novel of my fantasy trilogy, Daughter of Aithne is the culmination of a conflict that has spanned generations. It is the story of two powerful women – Eolyn, Queen of Moisehén, and Taesara, Princess of Roenfyn – who confront each other in a final, decisive battle for the throne of the Mage Kings. I’m a big fan of history and historical fiction, and I’ve always enjoyed stories of women in medieval and Renaissance times. I wanted to write a novel about women coming to power in a feudal society. The story is set in a fantasy world, but the characters are based on true women in history. As the series finale, Daughter of Aithne is the result of a long struggle by women to assert their destiny in a world traditionally dominated by men. Now that I’ve finished The Silver Web, I’m working on a contemporary fantasy collection entitled Path of Souls. Set in my home town of Kansas City, this series features mature women protagonists who take on a realm of supernatural beings in a brutal contest for dominion over human souls. I wrote my first story when I was in grade school. I’ve been writing ever since. 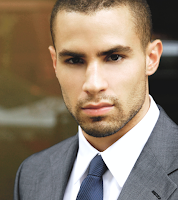 I don’t write fiction full time, though I do a lot of other writing in my day job. I’m a biology professor and department chair at my university, so all my fiction writing is squeezed into the edges of my life. During the summer, when we are on break, I write almost every day. When the semester is in session, I set aside 2-3 hours a week as my sacred writing time. As a behavioral biologist, I know a lot of interesting and sometimes crazy stories about animals and nature. I often use those stories to inform my fiction. Everything. I still kind of want to be everything. That’s why I write and journey with my imagination. One life is too short! If you like high adventure, complex characters, and a healthy dose of heart-wrenching romance, you will love my books! Daughter of Aithne can be read without having finished the first two books of the trilogy, but for a richer experience, I recommend starting at the beginning with Eolyn, Book One of The Silver Web. Novelist Peggy Jaeger is here today and we’re talking about her new contemporary romance, A Shot at Love. During her virtual book tour, Peggy will be awarding a $25 Amazon or Barnes and Noble to a lucky randomly drawn winner. To be entered for a chance to win, use the form below. To increase your chances of winning, feel free to visit her other tour stops and enter there, too! In 2017, she came in 3rd in the New England Reader's Choice contest for A Kiss Under the Christmas Lights and is a finalist in the 2017 STILETTO contest for the same title. 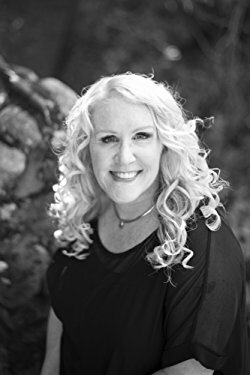 A lifelong and avid romance reader and writer, she is a member of RWA and her local New Hampshire RWA Chapter. Welcome, Peggy. Please share a little bit about your current release. What inspired you to write this book? 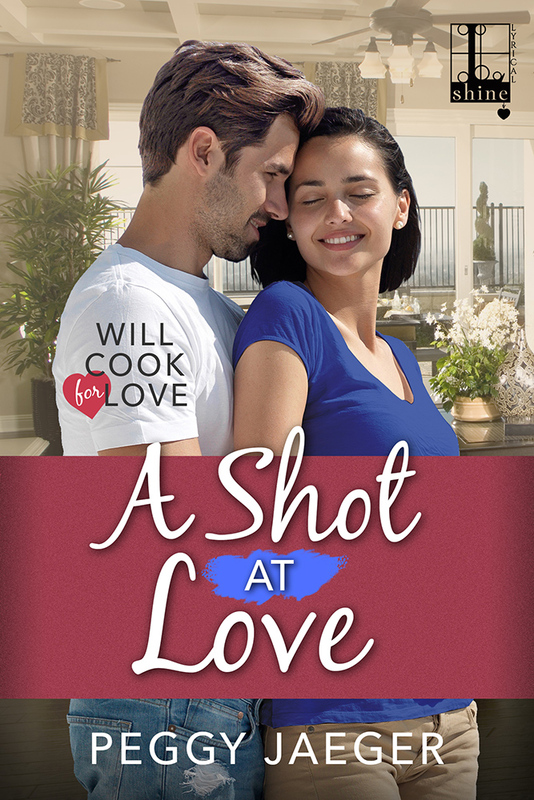 After I finished book 1 in the WILL COOK FOR LOVE SERIES, I knew I had to give Gemma her own love story. She comes across as flirty at times, hard as stone at others, and there were so many past factors that lead to her mercurial personality, I wanted to explore them and give her a man who would calm her fears about commitment and allow her to see her lifelong belief that all men leave just isn’t true. Plus, Gemma was the Laine sister I tagged as the Warrior and wanted to show her in all her bad-assery! Hair the color of midnight, straight as a board, fell to just below her shoulders, blowing back from her face in the gentle afternoon breeze. Blunt, chopped bangs, fringed a pair of large, bright blue eyes. Plump, coral colored lips moved as she spoke into the phone and for a brief, hot second, Ky wondered if they’d taste as delicious as they looked. His first impression of her height had been correct. She was maybe three or four inches shorter than his six foot one frame. As she moved closer, the hairs on the back of his neck stood straight at attention. She smelled as good as she looked and his nostrils flared from the scent of sweet cherries blended with some hot exotic spice. Book 3 in the series CAN’T STAND THE HEAT comes next. That’s cousin Stacy’s story and she’s in for a heck-uv-a-ride in Montana as the executive producer of a network Food Competition Reality show. Nikko Stamp is a take-no-prisoners director and has made it known more than once, and loudly, that he doesn’t want an executive producer underfoot. The two are polar opposites in everything and in every way and boy has that made for some fun writing! In all honesty, I’ve always been a writer, even from a young age. I was given one of those old-fashioned key-and-lock diaries when I was 6. I considered my life very boring at that time, so I started writing little vignettes about an only child of divorced parents and all the adventures she’d have while waiting for her parents to get home from work every evening. What’s that saying: art imitates life? Yeah, well at the time I was the only child – and a latch key kid at that – of divorced parents. Even though I was writing fiction, it was based on fact – the fact of my life. So, from being a life long diarist, it made sense I’d grow up with writing as my best friend. I do write full-time. In 2015, I retired from my life in health care when I got my first publishing contract. I always told my husband that if I ever got a contract in publishing I was going to leave my job and retire for good. I don’t know who was more surprised when I did just that and never looked back! I hate sounding conceited, but I’m really good at dialogue. I think it’s because I’m so nosy. I lovelovelove to sit in a restaurant, or at an event (like a movie theater) and listen to the people around me talk. You can learn so much about a person, their relationships, and the way they interact with the world just by eavesdropping. Because of that habit, I can hear how my characters speak, say words, even the idioms they use as part of their everyday talking life when I’m writing. I’ve changed dialogue so many times because the characters will actually tell me that it’s wrong for them. I’ve used a word they would never use; said a phrase they would never say. A nurse and a writer. I scored 100% on both! Read to your children and grandchildren. Every day. No matter what it is – the newspaper, a funny article, even if they don’t understand it. Read to them. I read aloud to my daughter when I was pregnant with her and I swear she came out being able to read! I’m not exaggerating but she did actually start reading on her own at a little over 2 years old. My husband and I knew she could do it when we took her to a restaurant for dinner, she pointed at a sign and said, “Exit, Mommy.” And it was the exit sign! We were both a little floored and whole lotta excited. Reading opens so many doors for people of all ages. It’s the one thing you can do no matter how old, infirm, or incapacitated you are – because you can always listen to audio books if you can’t hold a book in your hand. Give your children and all the children in your realm the gift of reading.